Is Muhammad a messenger now? Messengers did not join their own name to the shahada. Who testified that Muhammad is a messenger? The shahada that that the Quran teaches us, is simply testifying that: there is no god except God. There is no other name attached to it. This is testimony of God, the angels and those who possess knowledge. This is the foundation of the religion at God – islam. This statement of the shahada is repeated in its variations, about 30 times in the Quran. Every single time, it stands by itself, without joining other names besides God. For example, the famous ayatul kursi begins with this statement. The Shia and Sunni versions of the shahada, with Muhammad’s and Ali’s names joined with it [see samples in links below], does not appear anywhere in the Quran. Muhammad was a messenger when he was alive. Since he is dead and not living among us any more, he is no more a messenger. It is not logical to testify that Muhammad is a messenger, just like it would not be logical to testify that Abraham is a messenger of God. If we really wanted to testify to his status as a messenger, the correct statement should have been ‘Muhammad was a messenger’ (محمد كان رسول الله). God gives us a criterion to test ourselves, whether we truly believe in the hereafter …. If we feel empty, upset, perturbed or disgusted when God alone is mentioned, and feel happy and satisfied only when others besides Him are mentioned, we can gauge for ourselves whether this verse would apply to us. Do we try to rationalize it anyway? Do we think it cannot refer to us, and can only apply to those other people who are unsatisfied when God alone is mentioned, without mentioning others besides Him? God commands us to make no distinction between the messengers of God (2:136, 2:285, 3:84, 4:150,152). We have to treat all messengers the same, without elevating one messenger above others. All of them delivered the same message from God. If we consistently include one messenger in the testimony of faith to the exclusion of the others, that would amount to violation of this crucial commandment. And this listed among the fundamental qualities about being a believer. The shahada of all the messengers are one and the same – لا إِلَهَ إِلا اللَّهُ (la ilaha illallah). They did not compete with each other to modify, remove the names of others and add their own name to it. This is the timeless, universal shahada valid for all time. The act of testifying that Muhammad is a messenger is mentioned only once in the Quran. In sura 63, the title of which is al munafiqoon (The Hypocrites). And it is described as the act of the hypocrites. Not the ideal role models to follow.Despite the fact that they testified to the truth, God knew that they were liars. And it is telling that despite being conspicuously absent in all the verses that do mention the Quranic shahada (لا إِلَهَ إِلا اللَّهُ), God still mentions testifying that Muhammad was a messenger in the Quran, as coming from the mouths of hypocrites. 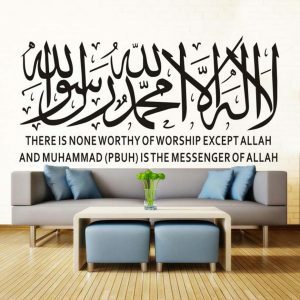 What about the statement مُحَمَّدٌ رَسُولُ اللَّهِ – Muhammad is God‘s messenger? It also appears once in the Quran. In the last verse of sura 48. It continues from the previous verse, which tells us that God suffices as a witness to it.